suggesting the early universe harbored more planets than has been thought. 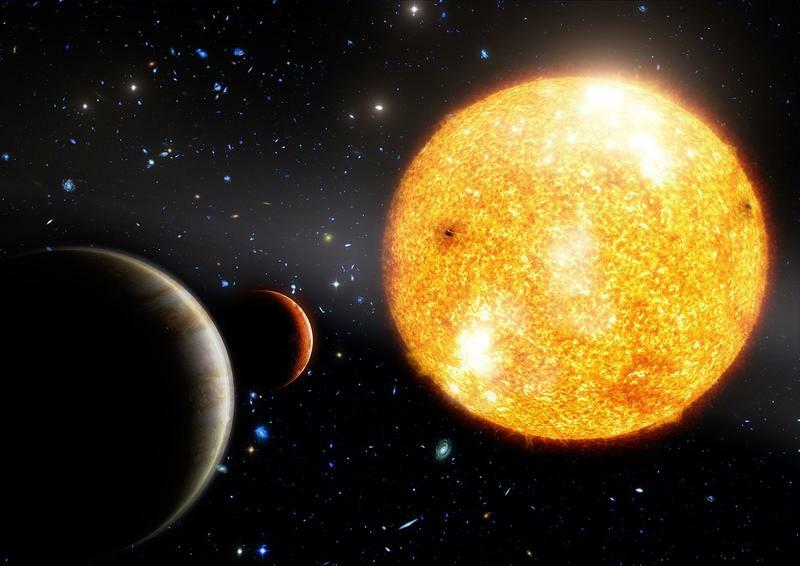 The system consists of a star called HIP 11952 and two Jupiter-like alien planets. It is just 375 light-years from Earth, in the constellation Cetus (the Whale). The planets are likely the oldest yet found, at 12.8 billion years old, they’re just 900 million years younger than the universe itself, according to the commonly accepted Big Bang theory. HIP 11952 contains very little other than hydrogen and helium. This is because the star is so old. In the universe’s early days, hydrogen and helium were pretty much the only games in town, virtually all the other, heavier elements were forged over time in the cores of stars and flung into space when the stars died in huge supernova explosions. It is widely accepted that planets coalesce from the swirling disks of dust and gas that surround young stars. Classical models of planet formation hold that metal-poor stars are unlikely to harbor planets, while worlds should form far more easily around metal-rich suns.But recent discoveries, including the HIP 11952 system, have astronomers rethinking these models. According to Veronica Roccatagliata of University Observatory Munich in Germany, the principal investigator of the planet survey that led to the discovery of the two HIP 11952 planets in 2010 they found the first example of such a metal-poor system, HIP 13044. Back then, they thought it might be a unique case, now it seems as if there might be more planets around metal-poor stars than expected. The world circling HIP 13044 became famous as the “exoplanet from another galaxy.” The star and planet are likely part of a so-called stellar stream, the remnant of another galaxy swallowed by our own Milky Way billions of years ago. Researchers suspect the same thing happened with the HIP 11952 system. HIP 11952b is nearly three times as massive as Jupiter and completes a lap around its star in 290 days. HIP 11952c has about three-quarters the mass of Jupiter and has an orbital period of just seven days. The team discovered the two planets after noticing a slight wobble that their gravitational tugs induced in HIP 11952′s position.